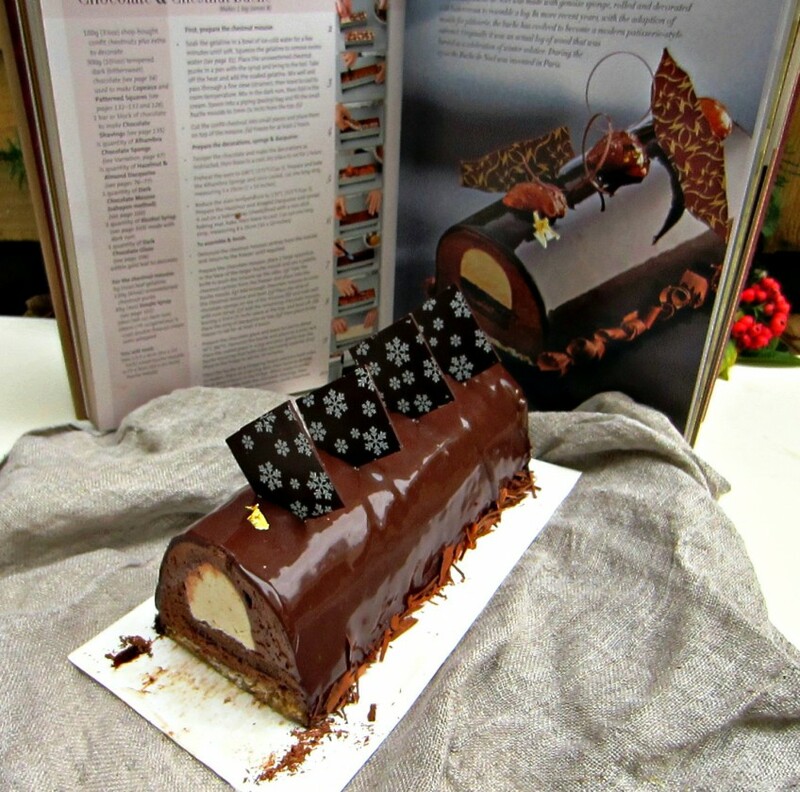 I’ve had my eye on this Chocolate & Chestnut Bûche de Noël for quite some time, but I had real trouble trying to get hold of some of the ingredients as well as the specialist tins to make it. By the time I had got everything together, it was December and it became the perfect time for me to create this amazing entremet. 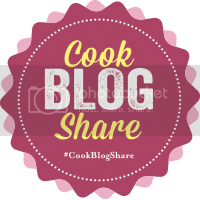 The Christmas bakes have been coming thick and fast this month – OK this is only my third Christmas recipe, some bloggers have been putting up a Christmas post every day so far, I don’t know how they do it. 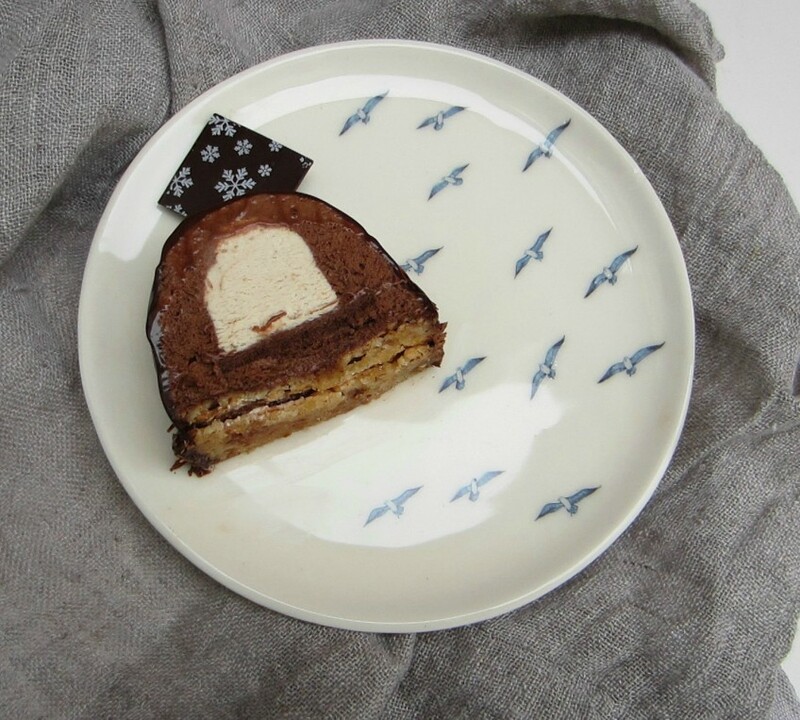 This Christmas entremet is available to purchase from William Curley and it was also featured on Mary Berry’s Absolute Christmas Favourites. Whilst my version is nowhere near as perfect as the version you can buy (or that featured in the show), the taste of the dessert is amazing and it was great to have another chance to practice entremets. Like most of these desserts, I split the components over a few days. Fitting the final assembly in around work, meant that everything took about 2 days in total. The dessert comprises two kinds of mousse, two types of cake, a rum syrup, a dark chocolate glaze and tempered chocolate decorations and chocolate shavings. Confit Chestnuts were also meant to be included in this recipe, but I was unable to get hold of any of these in quantities of less than a kilo, so I’m afraid I had to leave these out of the final dessert. The first step of making this entremet was the chestnut mousse, this mousse needs to be completely frozen so you can add it to the centre of the dessert and it keeps it’s shape. The hardest part of making the mousse was getting it out of the buche mould, normally with the cake rings a simple blast with the blow torch and these things slide right out once they’re frozen. This was not the case with the buche moulds, I heated them to a point where I could barely touch the stainless steel mould and still the little buggers wouldn’t come out. Eventually I had to use a palette knife and then reconstruct the curved shape. If anyone knows a better way to get these out of the mould please let me know, it was as though they had an air lock. Next time I think I’ll line the moulds with food grade acetate. Next two types of sponge are created and these are cut into rectangles, then a rich chocolate mousse is made. The mould is filled with the chocolate mousse and this is spread up the sides of the mould, the chestnut mousse is dropped in and then a layer of mousse is added. This is followed by the chocolate sponge which is soaked with the rum syrup. More mousse is added and then finally the hazelnut and almond dacquoise layer, the whole lot is put in the freezer for at least 4 hours. After trying to get the first mousses out of the mould, I was pretty anxious about de-moulding (not entirely confident that’s a word) the final entremet. It wasn’t any easier and the mousse was really stuck, It nearly melted when I eventually got it out and I had to smooth it with a palette knife and get it back in the freezer. I really don’t think these moulds should be this hard to use, so I think it must be something to do with my technique. The final part is the decoration. For me this is best and worst part of making the entremet. This is the stage where you get to make the dessert look really pretty, which is fun, but it’s also the part where two days worth of work could be ruined if the glaze doesn’t work, or you trim the cake badly. Thankfully that didn’t happen this time and I got to decorate the cake with some gold leaf (there’s only a small amount because I’d nearly run out), tempered chocolate squares and chocolate shavings. In an effort to show off this dessert, I used a beautiful plate that I’d been given by the wonderful team behind Washed Up. 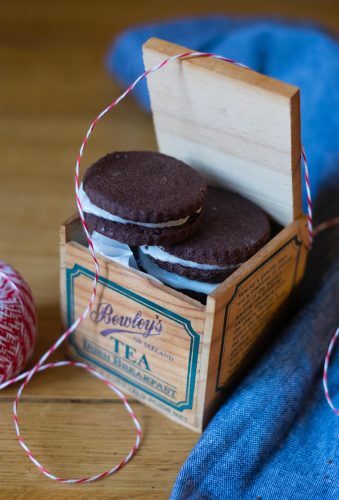 They make handmade tableware, with a detailed aesthetic, that is fit for function in the home, and reignites the sentimental memories we all have connected to the British coast. Their first collection takes inspiration from the coastal strolls of Kent, as well as the traditional blue and white ceramics, a famous example being the ‘willow pattern’. They feature Illustrated rows of beach huts and scattered seagulls, by Lorna Doyle, which are lovingly placed by hand onto Georgie Scully’s Ceramics. Each piece is made using the industrial method of slip casting with white earthenware, then glazed with a transparent glaze, and the final process is placing the illustrations on by hand which are printed as transfers. Washed Up has a website, here you can find out more information about their products and where to purchase them. They can also be found on facebook and twitter, so give them a like or a follow to see more of their stuff and the process behind how this wonderful pottery is made. In January this gorgeous plate is going to be featured in an exhibition at The Victoria & Albert Museum showcasing British designers of blue and white printed ceramics. This pottery is extremely well-made and very hard wearing. I love the designs of the scattered birds and the fact that no two plates are the same, yet they are a uniform design which means they would make a lovely set, should you be lucky enough to have more than one of these stunning designs. This brings me nicely onto the final part of this week’s post. I make no secret of the fact that I adore William and Suzue Curley’s book ‘Patisserie‘. It is the most comprehensive, well researched patisserie book that I have in my collection and now there is the chance for you to have your own copy. The team behind William Curley have kindly offered up a signed copy of this wonderful book to readers of this blog. I’m a little jealous of the winner of this competition, because not only is this a great book, but my copy isn’t signed. However it is covered in cocoa powder, egg whites and finger smudges, so I was too embarrassed to send it to them and request a signature of my own! 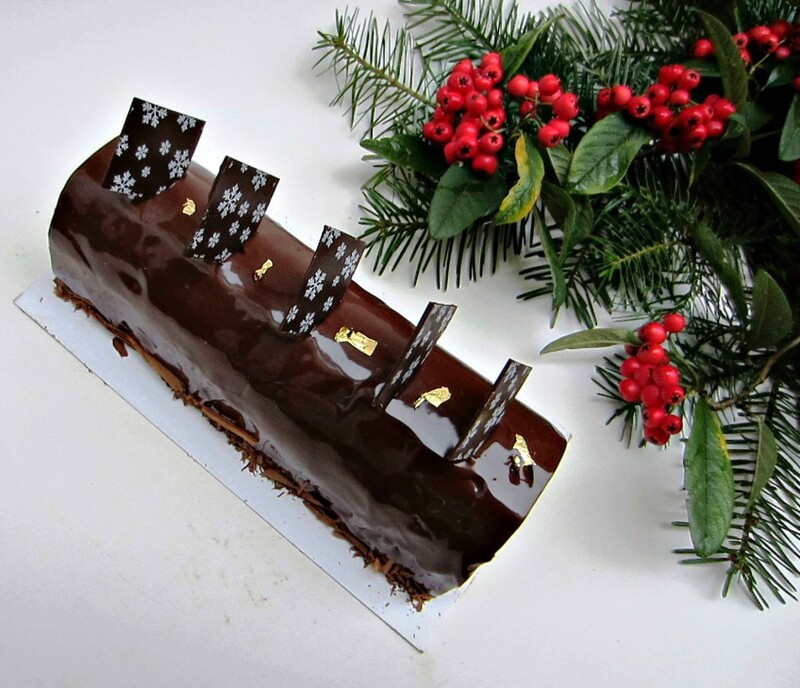 Finally here is the recipe for this delicious Bûche de Noël. To make this delicious buche de noel you will need two 13.5 x 4cm small buche moulds and one 25 x 9cm buche mould. Put the water, sugar and lemon zest in a saucepan. Scrape the seeds from the split vanilla pod into the water and drop in the empty pod too. Bring to the boil, and cook for 2-3 minutes. Take half the syrup and add 100ml of dark rum, this will be the rum syrup used later. Soak the gelatine in a bowl of ice cold water for a few minutes untl soft. Squeeze the gelatine to remove excess water. Take off the heat and add the soaked gelatine. 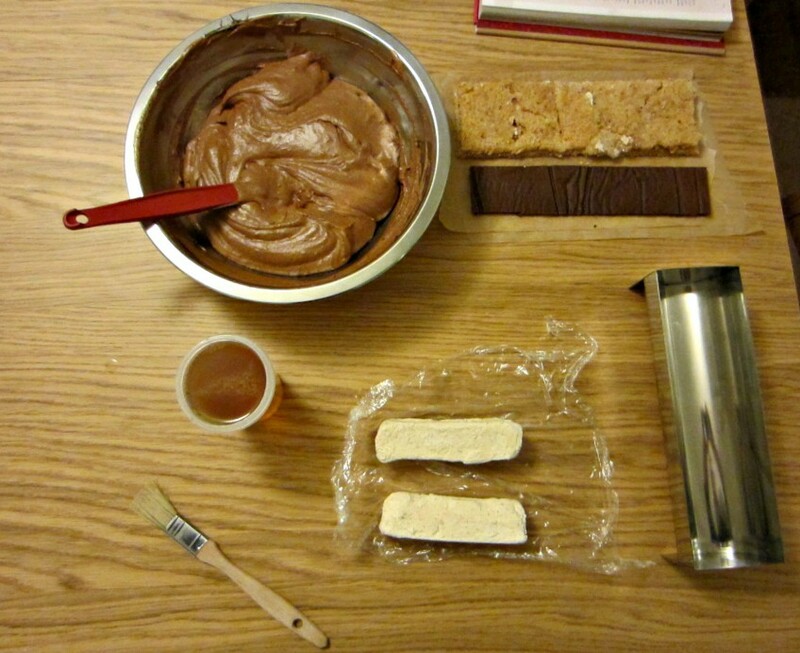 Fill the small buche moulds and freeze for at least 2 hours. Preheat the oven to 190C Fan and line one 30 x 40cm baking tray with silicone paper. Put the eggs, egg yolks and sugar in the bowl of your food mixer. Whisk over a bowl of boiling water, until the mixture reaches 37C. Remove the bowl from the pan of water and attach to the food mixer, whisking until the mixture achieves ribbon stage (this is when the mixture falls from the whisk in ribbons before sinking into the mixture slowly). Carefully fold through the flour, cornflour and cocoa powder mixture. Mix until the flour is incorporated and smooth. Pour into the prepared baking tray and spread out evenly with a stepped palette knife. Bake in the preheated oven for about 15 minutes until golden brown and the sponge springs back when pressed gently. Leave to cool. (Use immediately, or freeze for up to one month). Preheat the oven to 170C Fan. 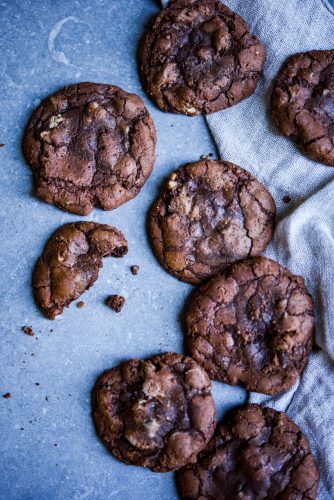 Spread the hazelnuts and almonds out on a baking tray lined with greaseproof paper and roast for 8-10 minutes. Melt the butter, making sure not to overheat. Mix the roasted nuts, half the caster sugar and the cornflour together thoroughly. Whisk the egg whites and remaining caster sugar in the clean bowl of an electric mixer fitted with the whisk attachment to a stiff meringue. Fold the dry ingredients into the meringue. Add a spoonful of the meringue mix to the melted butter and fold together. Pour the butter mix into the rest of the meringue. Mix with a spatula until you have a smooth homogeneous mixture. Pipe onto a baking tray (30 x 40cm max) lined with silicone paper. Dust liberally with icing sugar. Bake in the pre-heated oven for 18-20 minutes. (Use immediately, or freeze for up to one month). Melt the chocolate in a bain-marie until it reaches 45C. Soak the gelatine in a bowl of cold water for a few minutes until soft. Squeeze out the excess water. Strain then leave to cool. (Store in an airtight container and user within 4 days). Demould the chestnut mousse centres from the moulds and return to the freezer until required. Place 2 large spoonfuls of chocolate mousse in the base f the larger buche mould and use a palette knife to push the mousse up the sides. Take the chestnut centres from the freezer and place in the buche mould. Add enough chocolate mousse to cover the chestnut mousse and level. Cut the chocolate cake into a strip measuring 5cm x 25cm and place on top of the mousse, soak well with rum syrup. Add the remaining chocolate mousse and leave a 5mm space at the top and level off. Place a 8cm x 25cm strip of dacquoise on top and place in the freezer for at least 4 hours. Warm the chocolate glaze to 30C. Demould the buche and place on a wire rack. Pour the glaze over the buche ensuring it's evenly covered. Place in the fridge to set for 10 minutes. Place the buche on a chopping board and trim both sides to neaten. Place on a serving dish, then leave to defrost for at least 4 hours in the fridge, When ready to serve, decorate the sides with chocolate shavings and tempered chocolate squares and gold leaf. Thanks for reading and a have a wonderful Christmas whatever you’re doing. The seagull plate was given to me free of charge by Washed Up. 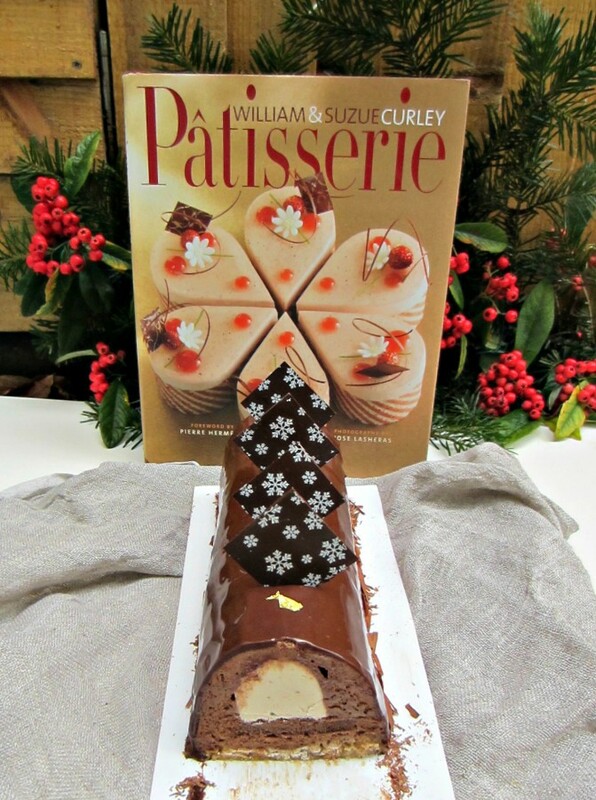 The copy of Patisserie by William & Suzue Curley will be signed and sent out by the team at William Curley. The competition is only open to residents of the UK and the closing date is midnight on 5th January 2015. Beautiful work, Angela! I have the same bouche mold and I understand your struggle with unmolding:( I want to buy a new one from silicone, so much easier! I’m so glad it wasn’t just me Anastasia! I found them so hard to unmould, it’s like there was so much suction, despite how much I heated the mould. Is the silicone good? I didn’t know you could get silicone moulds for this shape. This looks wonderful? 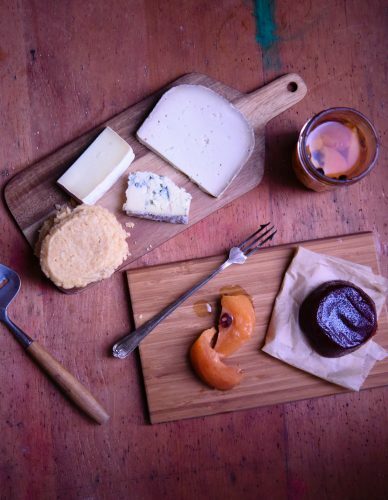 Where did you get the Bouche moulds? Macarons are actually not too bad to make and there are some lovely variations in here. A mix of classics and some interesting contemporary combinations. That looks amazing! I’d love to try and make Religieuse as I had a lovely matcha one recently! Religieuse taste delicious Jaye. I made a La Patisserie des Reves recipe a very long time ago (well within the last year, but it seemed longer). https://www.patisseriemakesperfect.co.uk/religieuse/ Good Luck with the comp and have a great Christmas Jaye. Wow! They look yummy. I’ll have to write a post about the one I tried recently. On a slightly related topic I bought a face cleanser from Lush recently called Bûche de Noël which is based on the dessert! Also, I love the plate in this post too. I realised that I didn’t say in my above comment! The plate is lovely isn’t it? Washed Up is a great brand. 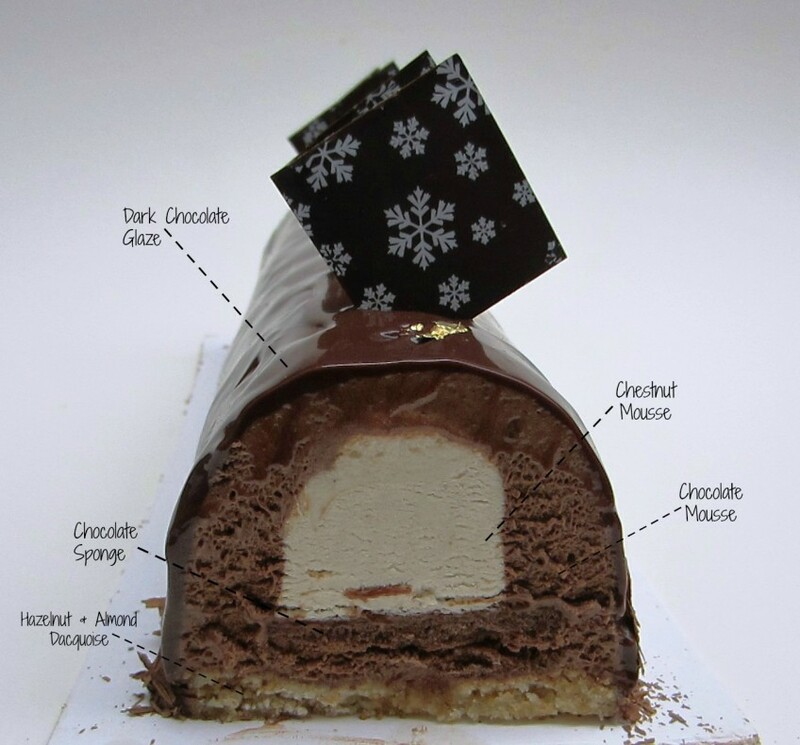 I’d love to know what the Buche de Noel you ate was like. Where did you have it? This looks amazing! Such a lot of work though…but I imagine it’s worth the effort! It was worth the effort Hannah – the taste was amazing. 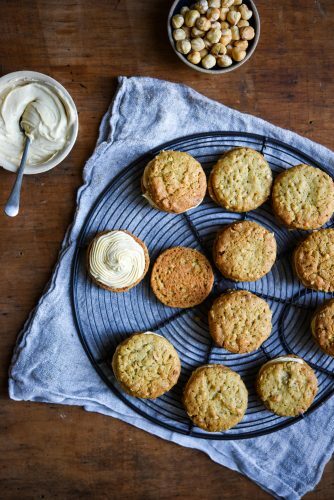 I’ve seen some of your bakes on your blog and they don’t look too easy either. Thanks for commenting. Aww thanks Sophie, you’re too kind. It was really fun to make, despite the stress of making sure it turned out as well as possible. The plate is beautiful too. I really want to get some more of these, they’re so summery. Gorgeous as ever Angela! Such a lot of work judging by length of recipe alone… though I am sure worth it! The plate is lovely as well. Thank you Lucy! I approach a lot of these entremets in the same way. There is a lot of time between making the components, so while things are freezing and chilling you can get on with other parts – or use it as an opportunity to do the dishes. This took me a couple of days, but I wasn’t flat out, it was just an hour here and there. The plate is gorgeous isn’t it? They are so well made, their other designs are great too. Oh wow, it looks amazing and I bet it tastes even better. I love the texture of the mousse, so creamy. May I say that you’re doing so much progress, well done! Also, I’m jelous on that pan, I’ve been looking for one for a long time in Romania but without success. Oana the pan took me so long to find too, I bought it here: http://www.caterfor.co.uk/cookware/terrine-pate-moulds/vogue-stainless-steel-moulds/vogue-terrine-mould-st-st-u-250x80x75mm-cf-e585 but it doesn’t look like they ship abroad. If you’d ever like me to post one to you, let me know and I can check the delivery costs for you. The dessert tastes amazing, the chestnut mousse is so light and the perfect amount of chestnut has been used, so it’s subtle. but you know it’s there. Eclaires! I would love to try those! Sounds delicious Tracey. 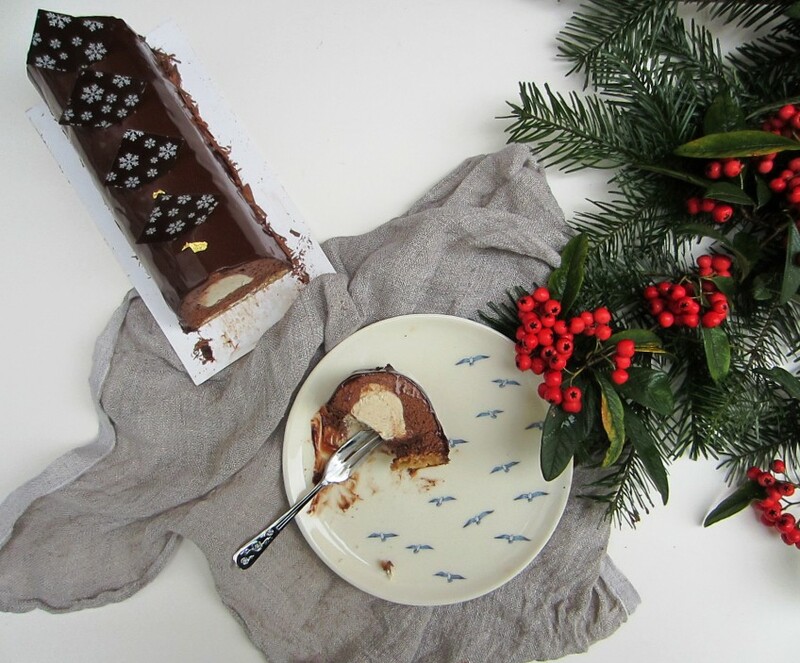 As you can tell from this post, I love a chocolate log!